> One current RedHawk and two future RedHawks have found themselves on the NHL Central Scouting’s final rankings list. 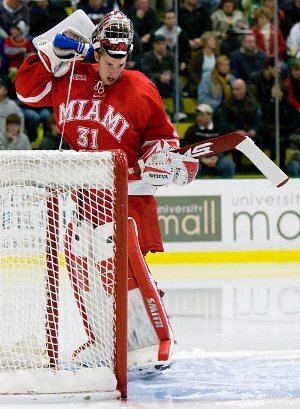 Freshman goaltender Connor Knapp was ranked number 19 on the list of 31 North American goalies that are draft eligible. In his freshman campaign, Knapp posted a 13-5-3 record and a 2.09 goals against average. Also on the list were “RedHawks to be” Curtis McKenzie and Reilly Smith. McKenzie, set to join The Brotherhood in the fall, checked in at number 89 on the list of 210 skaters. He led the Penticton Vees in scoring this season, with 33 goals and 41 assists. Smith, a 2010 commit, was further down on the list, at number 158. > According to the Penticton Western News , Penticton Vees (BCHL) forward Curtis McKenzie, has accepted a scholarship offer from Miami and apparently chose to attend college and play in the NCAA, as opposed to going to the WHL. McKenzie will not sign a letter of intent until November, therefore the University had no official comment. The 6’1, 190 lb-seventeen year old split time last season on the third and fourth lines, and finished the 07-08 campaign with 3 goals, 7 assists and 81 penalty minutes. His scholarship begins in the 2009-2010 season, but an option is available for deferment until the 2010-2011 season.